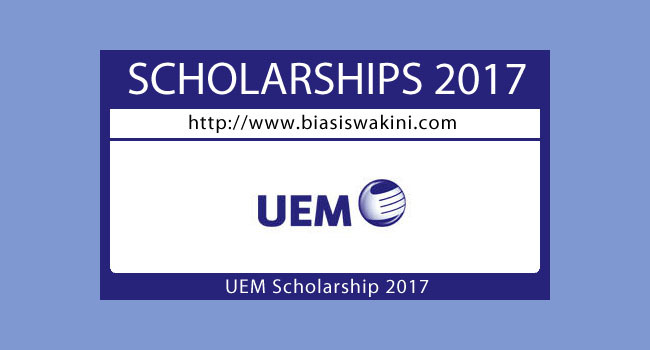 UEM Group Scholarship Programme 2017 is an annual initiative that supports the nation's objectives of creating elite scholars and serves as a talent supply chain in developing future leaders for the country. Undergraduate studies at Universiti Teknologi Malaysia (UTM), Universiti Putra Malaysia (UPM), Universiti Kebangsaan Malaysia (UKM), Universiti Malaya (UM), Universiti Islam Antarabangsa Malaysia (UIAM), Universiti Sains Malaysia (USM), Universiti Utara Malaysia (UUM), Universiti Teknologi MARA (UiTM) - All Branches, University Teknologi Petronas (UTP), Universiti Tenaga Nasional (UNITEN) and Multimedia University (MMU). Others will not be considered. In nurturing our scholars, leadership training and development activities with job attachments within the UEM Group of Companies are provided throughout the programme and within the bonded period. 0 Komentar untuk "UEM Scholarship 2017"